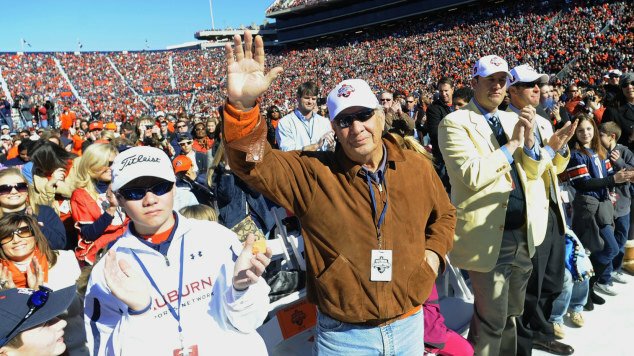 Pat Dye is almost 74 years old and he’s sitting up in an excavator on his cell phone and he tells me he thinks Gus Malzahn’s hurry-up offense is great, not necessarily the demonstration of it last Saturday night, but the philosophy behind it, the potential. So as player and coach and master of the game for a hundred years, do you think that if you had a good quarterback operating the HUNH with a good team that was clicking on all cylinders… do you think that, you know, there actually is an answer for it? He answers the question like he’s glad someone finally asked him. Doesn’t hesitate. He thinks Auburn has speed on offense. Dye seems especially high on Coates’ potential to turn speed into points. What’d you think about Gus goin’ for two after the first touchdown, Coach? Related: Pat Dye speaks out on Penn State, Sandusky.